Most homeowners don’t think about the state of their gutters unless something isn’t working correctly. As soon as you notice that water is running over the sides of your home or your gutters are pulling away from the home, suddenly it’s all you can think about. 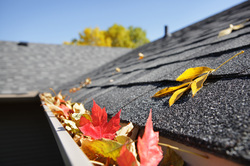 What you may not know is that you should have a gutter cleaning twice a year, even if no problems are evident. You can choose to handle this task on your own or you can work with a professional. If you prefer to save money, cleaning your own gutters can be a reasonable idea. Assuming you already own a ladder, you can often clean your gutters for only a few dollars. All it takes are a few household items and a gutter scoop of some sort. On the other hand, professionals may charge from around $75 to $500. The price depends on the size of your home, how clogged your gutters are, and how many stories are in your house. That said, you do tend to get what you pay for. The least expensive gutter cleaning services may not do a job as well as the ones who charge a bit more. Another reason people may choose to do their own cleaning is because they enjoy maintaining their home. It can provide a sense of pride and accomplishment that isn’t possible if someone else is to do your gutters for you. However, there are reasons to hire someone instead of doing it on your own, as well. Cleaning the gutters is a dangerous proposition. Getting onto a ladder provides a risk of falling. There can also be health concerns when you come into contact with bacteria and mold. Professional technicians will level your gutters for proper flow of water. They’ll also ensure that your gutters are hanging properly and replace any materials that required it. This is often included in the gutter cleaning price itself, which can make it worthwhile to consider. If you’re accident prone or have health concerns, hiring a professional is an excellent idea. Talk to your friends and neighbors to find an experienced technician in your area.